The Gold Coast (the whole of Australia in fact), is rich with attractive food to photograph, though jerky, most definitely does not fit into this category! A new Surfer’s Paradise client of mine needed to rebrand and reshoot their jerky food packaging imagery. Their brand is very popular with tourists visiting the Gold Coast, though was in desperate need of more contemporary food photography to give the pack some shelf appeal. The challenge with photographing meat, is always making it look succulent without glistening like a terd, fresh without looking like an abattoir floor, textured without looking like graphic roadkill. Understandably, this is precisely why few food photographers are comfortable shooting meat! 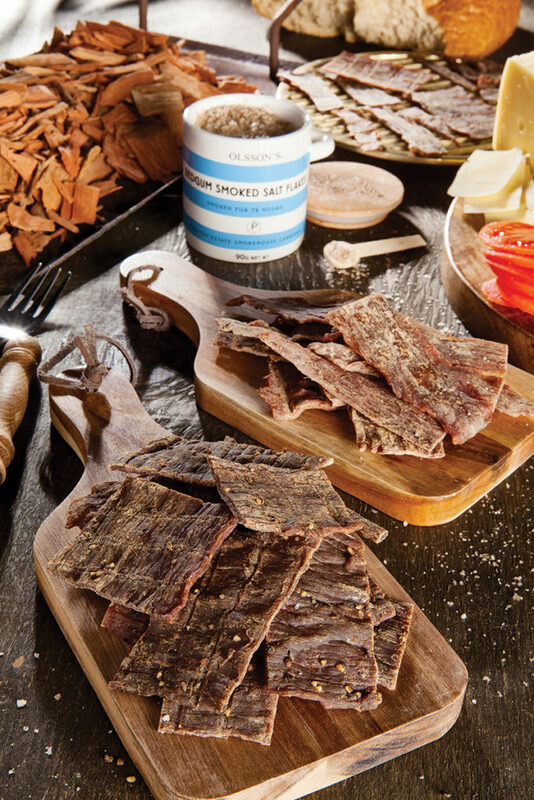 As a food subject, jerky simply is what it is – dehydrated cuts of seasoned meat. It splits and becomes heavily textured while drying and looks like a bicep off-cut left in the sun. And there is no succulence to capture with dehydrated foods. Challenge accepted! Fortunately for me, some years back I had a trial by fire to really perfect my lighting techniques when shooting meat products in a marathon three day shoot involving entire carcasses being wheeled into the studio to be butchered and photographed! Being so familiar with the reality of how the product looks, my client was beside himself with happiness when he saw the final shots. 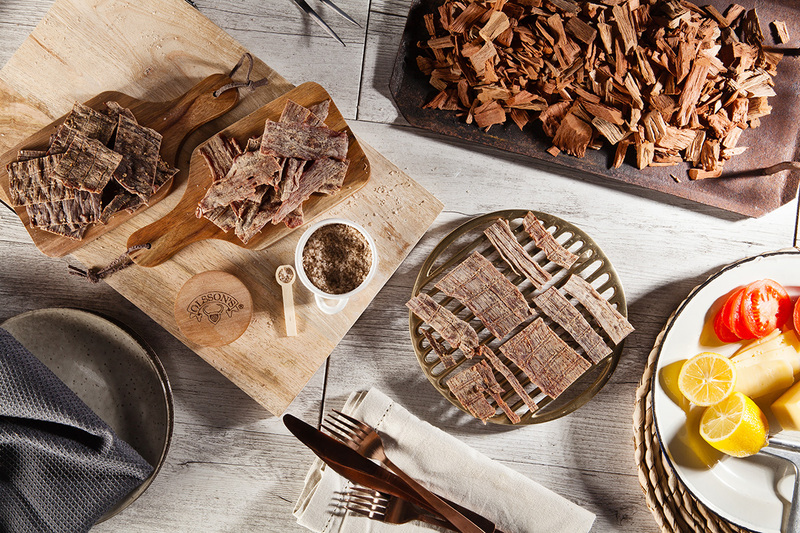 I tried to style the below shot in a way that tells the story of jerky a little, by way of serving and pairing suggestions and also brass drying racks subtly featured in the background. Whether sharing a platter with friends or demolishing an entire bag on your own with a beer in a hammock and a self-indulgent grin, I think the final photographs are plenty to tempt buyers to pick up a bag of the world’s ugliest food type and enjoy it!